Malaysian Deputy Prime Minister Ahmad Zahid Hamidi has affirmed that Malaysia wishes to continue promoting its multifaceted cooperation with Vietnam. Meeting newly-accredited Vietnamese Ambassador Le Quy Quynh in Kuala Lumpur, on October 25, the Deputy PM expressed his satisfaction with regards to the positive progress in trade and investment ties between the two countries, affirming that Malaysia is interested in conducting business in Vietnam and will facilitate the ties between the two nations’ businesses. Malaysia wants to continue fostering its bilateral partnership across security, crime prevention, labour, economy, trade, investment and tourism, he said. The host expects that Malaysia and Vietnam will soon convene the first meeting of the Joint Working Group on trans-national crime prevention and control, accelerate the signing of agreements on human trafficking prevention, and judicial assistance in criminal affairs and extradition. He expressed his wish that the issues related to fishing vessels and fishermen would be positively addressed. 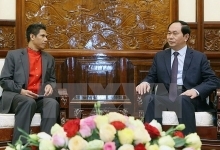 On labour cooperation, he noted that Malaysia is ready to receive more Vietnamese guest workers. Quynh, for his part, affirmed that the Vietnamese government always treasures its strategic and comprehensive partnership with Malaysia. He also vowed to do his utmost to push forward the bilateral ties.